International TV Shopping Systems (ITVSS) is your one stop Television Home Shopping System, from taking your first order, through Real-time Sales Analysis to Studio Programming. ITVSS founders have been involved with TV Home Shopping market since 1995. 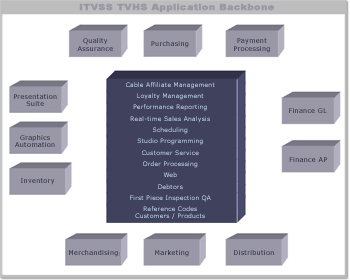 ITVSS provides the backbone to any TV Home Shopping operation. Our software supports every facet of the business yet also provides the facility to integrate to any desired external application. A completely integrated system, ITVSS allows your business to grow while your IT costs don't. With our extensive customer website interface and our expandable IVR system, keep your customers happy with a fast and reliable service. A turn key solution for any Home Shopping operation. Fully extendable, so while sales increase, costs stay low. Plug into any external application, including Graphics Automation & Warehouse Management Systems. Web based order entry system, so orders can be taken from anywhere, anytime! Supplement your call centre with low cost IVR and transactional website solutions. Immediate integration to any website design. Real-time sales data, delivered straight to your inbox. © Copyright 2019 International TV Shopping Systems. All Rights Reserved.